After three days of fishing, a 31-pound 6-ounce chinook leads the Sitka Salmon Derby. While the leader is excited to be in the money, he’s also aware that should he hang on to his lead after two more days of fishing next weekend, this will be the smallest fish in 63 years to win Sitka’s derby. Well, like many a leader after the first weekend in the two-weekend long event, Pat Dodson is not giving anything away. “For a hint, I was very close to town,” he said. Thanks for the tip, Pat. Just about everyone in the 63rd Annual Sitka Salmon Derby was close to town, as gusty winds and driving rains churned Sitka Sound into frothy tempest. Dodson who manages inventory for the Southeast Alaska Regional Health Consortium, and who is a veteran of many derbies, said he settled into a protected spot and waited for the fish to bite. 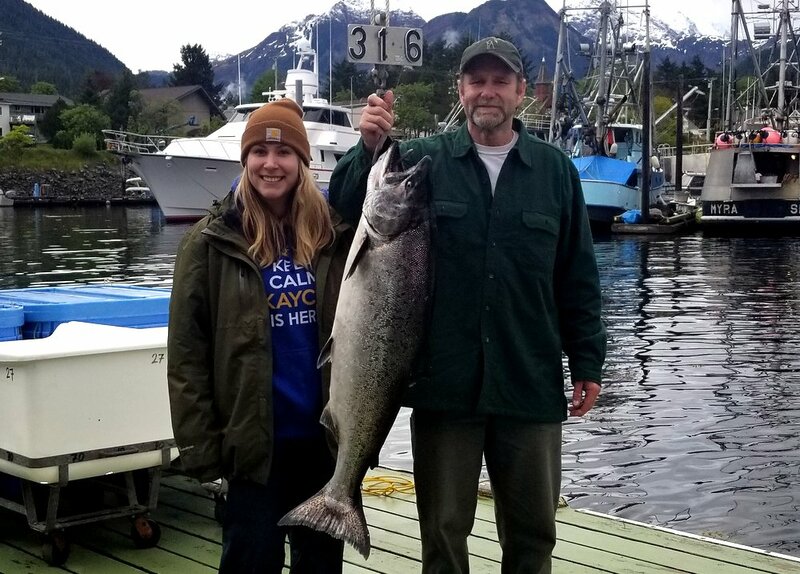 When he brought his king into the weigh station with just 20 minutes to spare on Memorial Day, he was surprised to learn that his 31-pound 6-ounce chinook was at the top of the leaderboard. “I don’t think a fish that small has ever won the derby, and I know they’ve been getting smaller over the past couple of years. I’d really be surprised if that stayed,” he said. But it might stay, and if it does Dodson will win another $7,500 — on top of the $500 for having the biggest fish on Monday. While everyone knows there are big fish out there — the biggest king ever to win the Sitka derby weighed over 73 pounds — everyone also knows the 40- and 50-pounders are becoming scarcer. Although it seems counter-intuitive, king salmon aren’t getting smaller. Ed Jones, the chinook salmon research coordinator for the Alaska Department of Fish & Game, says kings are getting younger. “What’s really driving that issue with chinook salmon getting smaller is there aren’t any older-age fish anymore. They’re coming back younger,” he said. Jones made this presentation on May 21 in Sitka, as part of the state’s Chinook Salmon Symposium. It was an effort to bring everyone up to speed on the latest science — and politics — driving reductions in the Southeast king salmon harvest. Last year’s derby winner weighed 35-pounds 6 ounces — likely a five-year old salmon that’s been in saltwater for three years. The 2016 winner weighed 40-pounds 8-ounces — again, maybe 5 years old — which until then was the smallest fish to win. From 1956 to 2014 derby winners always tipped the scales in the neighborhood of 50 to 60 pounds and up — likely all fish that were at least six years old. Pat Dodson came in third a couple of dozen years ago for total poundage. He’s seen the big fish come over the rail. Dodson fished all three days of the Memorial Day Weekend, despite the miserable weather, and he plans on fishing both days next weekend as well. Like all other derby participants, he’s not put off by this year’s one-fish bag limit on the outer coast. “The weather is probably a bigger factor,” he said.